Please fill out the form and click “send”, we will reply to you shortly. Use special DC TECHNOLOGY to avoid the risk of ventricular fibrillation caused by AC power; meantime, DC can make powerful spark and crackling sound for threatening purpose. X-1 will stop working if snatched away to avoid any unauthorized use. Made of carbon fiber for extreme durability, able to withstand 1.5m drop. Easy to operate, only simply training is needed. With detachable design for possible repair. According to the research of IEC TS 60479-1 from International Electro-technical Commission, DC power is much safer than AC power to human and animal body. 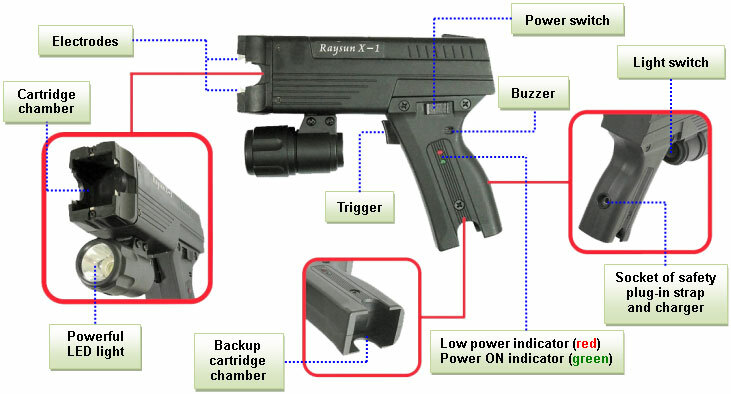 Integrated powerful LED light featuring illumination (up to 100M above) / aiming / giddying purposes. 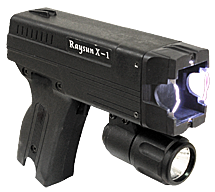 The unique & powerful multi-functional non-lethal weapon. Launch two barbed probes attached to device by two conductive wires ; from as far as 3.5/6m, the device transmits electric shock through the wire to immobilize the target. It's ideal for mid-range defense. Cause the target tearing, coughing and disability on eyes opening after being inflamed with superb spicy powder. The powder is diffused over the air with effective range up to 3~5m. Same effect as pepper powder, but effective range is further up to 12~15m away. 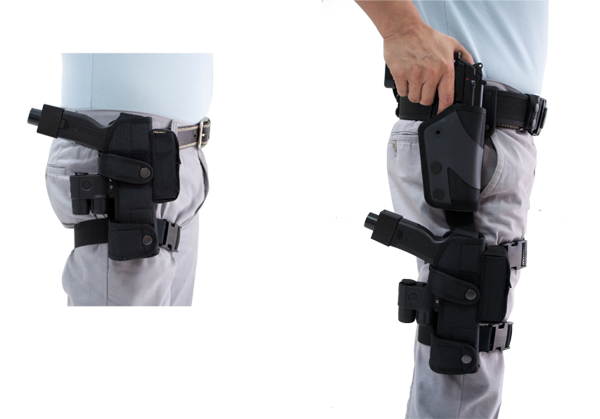 With unique trail design to increase the shooting accuracy while not cause any bodily harm. After fire, a huge explosion sound will be created, and meantime, an unbearable pains will be made to effectively intimidate the target. The huge explosion sound, 80 meter away from being fired, can cause intimidating and stunning blast effect to people around. 150 db 2 meter away from the explosion, however, the egg laid at 50 cm away from the explosion remains unharmed. It is perfectly effective in driving out riot or animals without causing any harm to them. Fire as high as 80m in the sky to create a powerfully flaming signal for SOS or help the target positioning. Adopt non-washable dye to make obvious marks. The dye has a blood-like color which may scare the target as he will be under an illusion that he is bleeding after got shot..
Use with X-1 or X-1 plus to extend the effective range. Allow to use as a stun baton to enhance the defense during confrontation. Illuminator Deploy with a powerful LED Light, illuminating range up to around 100M. Industrial Technology Research Institute : Test on wave type, electric voltage, electric current. National Taiwan University of Science and Technology: It’s proven to be completely safe to human body. Electronics Testing Center, Taiwan: It’s proven to be completely safe to human body. Automotive Research & Testing Center: The test result is non-lethality after conducting cartridge shooting tests. This product is licensed and has insured for 20 million with the First Insurance Co., Ltd. WARNING: This device should only be used in accordance with local laws and regulations. We are not responsible for any misuse of our products and take no responsibility for injuries as a result of improper handling or abuse. We also reserve the right to vary, modify or improve on any specification and/or design at will without any prior notice in accordance with our company’s commitment to quality control and excellence. 1F No.12 Shao Hsing South Street, Taipei, Taiwan R.O.C.